Choosing the right stroker crank can mean the difference between ultimate power and rock-steady reliability. Here's the skinny on picking the perfect combo to suit your next build. The increasing availability of stroker crankshafts is giving builders more options when planning a street-performance or race engine combination. The benefits of a stroker crankshaft, however, must be balanced with addressing critical issues of clearance, piston speed, rod-length ratio, compression and balance. Another often overlooked if not ignored scenario of a stroker assembly is the long crank throw pulling part of the piston skirt out of the cylinder sleeve at bottom dead center (BDC). This action could damage the skirts and induce ring flutter. Changing an engine's stroke affects a multitude of design factors on a piston. Compression height, skirt design, and crown volume are just a few of the variables that need to be adjusted. 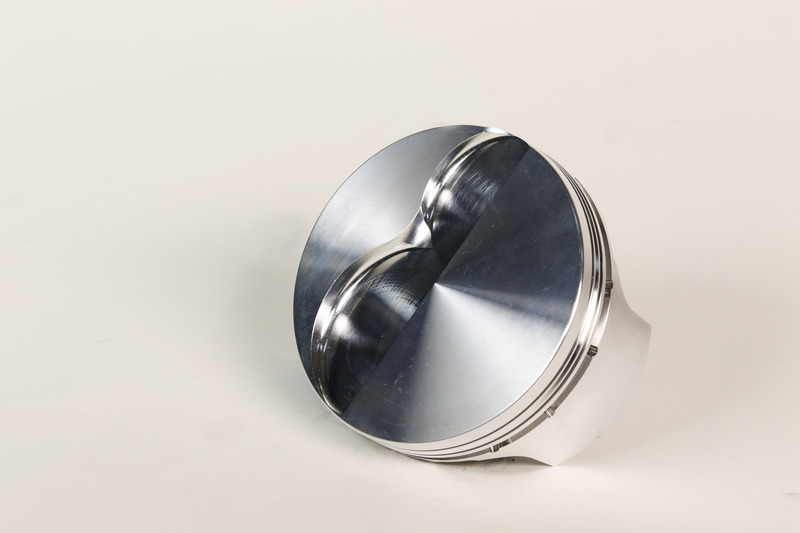 Just as the correct piston will help resolve issues of compression and rod-length ratio, a properly designed stroker piston will also remain secure inside a production cylinder block. Note how the wrist pin intersects the oil ring. This requires an oil support rail, a thin ring of steel, to bridge the gap and keep the oil ring from fluttering and causing excessive oil consumption. According to JE testing and calculations, the 3.900-inch stroker crank is the most practical for the LS engine when balancing power and durability.“It gives enough of a displacement increase to make most people happy, and is substantially more stable in the cylinder bores in comparison to 4.000-inch and larger strokes,” explains DiBlasi. Before offering more details on the piston design, let’s review the dynamics involved in installing a stroker crankshaft. The goal, of course, is to increase engine displacement—allowing more air and fuel to fill the cylinder on each firing cycle. It’s perhaps the first power trick discovered by designers and builders of the internal combustion engine. In early days, crankshafts were stroked using a method called offset grinding, but the real visionary tricks came with rather creative mixing and matching of rods and pistons to complete the rotating assembly. Veteran hot rodders may remember stroking early small-block Fords with Pinto connecting rods and Chevy pistons, and there are dozens of other similar innovative combinations in the history books. Today, there rarely is a need for such hybrid formulas as the aftermarket offers complete stroker kits in a variety of sizes for all popular engines. When moving between a 3.900 and 4.00 stroker crank, the pin must be moved up on the piston. On the 4.00-stroke piston (left) the pin will intersect the oil ring, requiring a support rail. On the 3.900-stroke piston, there is enough meat left to use a conventional ring pack without a support rail. But making a change to improve one performance factor in any engine always affects some other operating characteristic. Most obvious in a stroker engine are clearance issues, such as the connecting rods or crank counterweights interfering with the bottom of the cylinder, pan rails or even the camshaft. A grinder solves some of those problems, or the solution may be more complicated like custom ordering a small base-circle camshaft to attain the necessary clearance. Increasing the stroke also affects the geometry inside the cylinder. Either connecting-rod length must be shortened, or the pin height on the piston must be shortened to compensate for the added length of the crankshaft arm. Engine builders don’t like short rods because a higher rod angle is created with respect to the crankshaft journal location during rotation. This, in turn, increases pressure on the cylinder wall thrust surface and wears out the piston, rings and cylinder much quicker. This crankshaft has a 4-inch stroke. While the 4-inch stroke is one of the most popular stroker cranks for the LS engine series, it often causes the piston skirt to pull out of the bottom of the bore at BDC promoting accelerated wear. A 3.900-stroke provides a similiar displacement increase with better wear life for a street car. 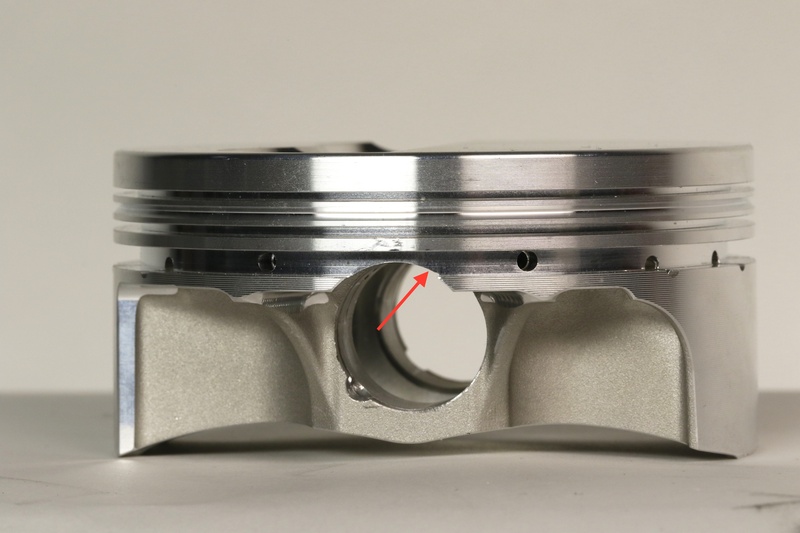 So, it’s up to the piston manufacturer to make up the difference by moving the location of the wrist pin—which is called the pin or compression height—closer to the top of the piston. There are obvious limitations to how short the pin height can be engineered because of the ring locations. With a large increase in stroke length, the piston manufacturer also has options in skirt design to help minimize if not avoid exposing that skirt at BDC. 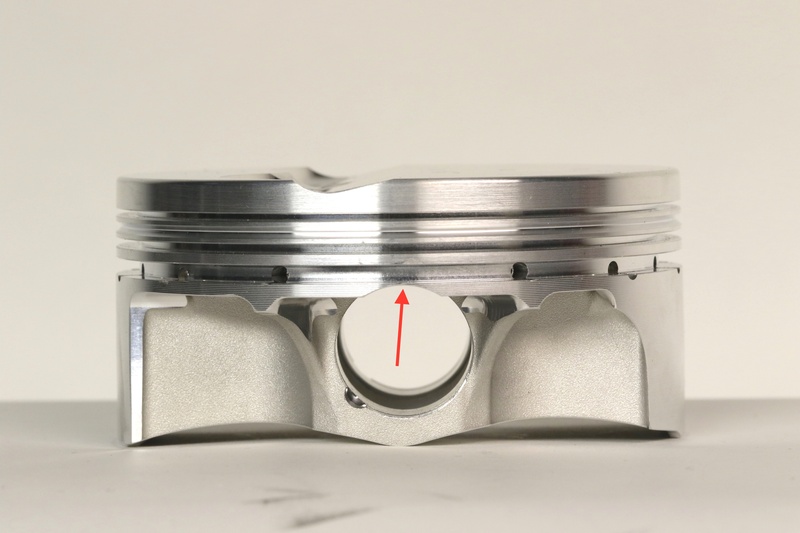 This 3.900-stroke piston has enough meat above the pin to use a conventional piston ring. Over the years the aftermarket developed stroker assemblies that offer engine builders aggressive options in either pursuing more horsepower or more conservative combinations targeting durability and engine life.The 6.0- and 6.2-liter LS V8s are among the most popular production engines today that receive stroker kits. Both feature a 3.622-inch stroke crankshaft and connecting rods with a 6.098-inch center-to-center distance. “While we see some people utilizing big strokes on the 4.8-liter, 5.3-liter and LS1 engines, it is much less common. Most of those builds are to meet a specific budget. Sometimes adding a forged crank alone is more expensive than the entire build cost,” says DiBlasi. Popular stroker cranks for the 6.0-liter (364.1 ci), which has a 4.000-inch bore, and the 6.2-liter (376.1 ci), which has a 4.065-inch bore, are 3.900-inch, 4.000-inch, 4.100-inch and 4.125-inch. With a 4.065-inch bore, the respective displacements with stroker crankshafts are 404.92 ci, 4.15.3 ci, 425.68 ci and 428.8. With a 4.000-inch bore, the respective displacements are 392.07 ci, 402.1 ci, 412.18 ci and 414.7 ci. “The most common of the very large strokes is 4.100 and 4.125. A 4.250 crankshaft might be able to be shoved in there, but it can’t look pretty,” says DiBlasi. Again, this discussion focuses on production LS blocks. There are aftermarket blocks and the popular GM LSX iron block that are designed to support longer strokes—some with a taller deck height and longer cylinder sleeves where exposed skirts at BDC are more easily resolved. This view, from the underside of the pistons, shows the difference in wrist pin position and the affect on the ring pack. The pin intersects the oil groove (as shown on the right). JE piston solutions for LS strokers are usually designed around the popular 6.125-inch connecting rod. With a 4.000-inch stroke crankshaft, the rod ratio is 1.531:1. Most engine builders shy away from rod ratios below 1.5:1, as the angularity gets rather intense beyond that point. But the decision to go with a 4.000-inch crank or longer depends on the engine builder’s goals. 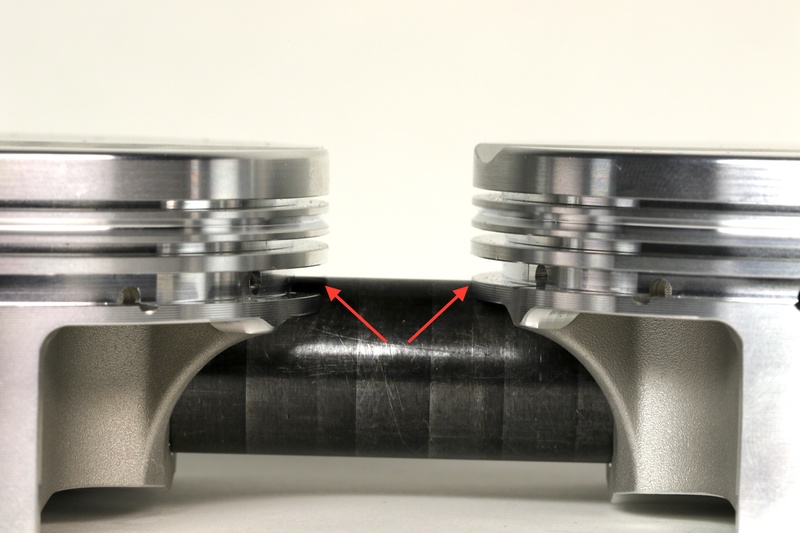 As the engine stroke increases, either the compression height or connecting rod length will need to decease to keep the piston from coming out of the cylinder at TDC. Stroker kits also affect bearing life and piston speed, but these are factors that engine builders will accept. Maximum piston speed is the highest speed the piston will see as it moves from TDC to BDC and back to TDC, and that number is important to help engineers determine piston construction and ring package. Piston speed is a direct relation between stroke and RPM. For example, with a stock LS 3.622-inch crankshaft running at 6,500 rpm, the maximum piston speed is 65.4 feet per second (FPS). Go to a 4.00-inch stroke crank at the same RPM, and the piston speed is 72.2 FPS. With a 4.250-inch stroke the piston speed picks up to 76.7 FPS. Conventional wisdom says piston speed should not exceed 140 FPS, so there’s plenty of breathing room for stroker LS cranks. In fact, a 4.000-inch stroke crank would have to spin over 12,500 rpm before coming close to 140 FPS. “The weight is also a big factor with piston speeds. It’s not just about the speed, it’s about how much mass and at what speeds,” adds DiBlasi. “For instance, a 1,500-gram piston and rod assembly would be extremely abusive on the bearings and rods bolts compared to a 1,000-gram piston and rod assembly. The load that a 1,500 gram assembly would exert at 80 FPS would be vastly more than a 1,000-gram assembly at the same speed. So the piston speeds are not the only factor to consider. One final consideration when stroking an LS engine is pushing the piston out of the top end of the cylinder. Although not an ideal scenario, it’s not uncommon. Late-model production engine aren’t always stroker friendly. Fifty years ago the common measuring stick was horsepower per cubic inch. At the turn of the century, “power density” became the motivating buzzword for powertrain engineers. They were charged with getting the most horsepower out of the lightest and smallest package. Accommodating stroker kits was not a priority. However, the aftermarket has adapted rather cleverly. As noted earlier, however, pushing the limits of displacement is not always the best approach because so many other performance factors and engine dynamics are affected and possibly compromised.